Darnizhaan. Truth be told I'm stoked that no one has done this before! I wouldn't mind having every one of them line my garage. Hm, I got the painting skill just not the shield-making skill. They look great! Do they have the entire collection yet? 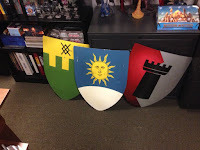 I'm pretty sure they had shields made for every region during LG days. These are likely leftovers that no one claimed. Very nice, though. I'm trying to work up some wooden shields on a CNC in my shop (I'm a teacher), though time is my enemy at the moment.